I'm sure it has already been discussed here many times, but I'm not able to find it. So here it goes. I've had problems with a reference that didn't work as an in-text citation (because I had chosen the "only in the bibliography" option, now I realise), so I deleted from both the project and the text it and re-added it (cut and paste, that's all), so it could be added as an in-text citation. The problem now is that Citavi seems to have made a duplicated of the reference. It appears just one time in the bar of the Word add-on (and it's only one reference in the Citavi project as well), but it figures as two different references in the Bibliography and whenever I try to cite it, it randomly adds an "a" or a "b" as a suffix (it's either [Cuello, 2009a] or [Cuello, 2009b]). It goes without saying that I don't want to have it that way, because it's just one source that I'm citing all these times. Could anybody give a helping hand and tell me what to do? 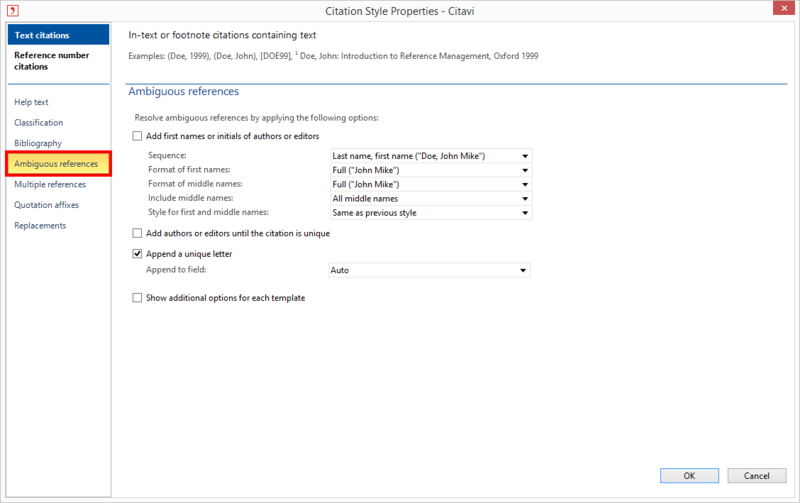 If you select the option Append a unique letter in your citation style, Citavi will automatically ensure that reference ambiguity is avoided. The publications are sorted alphanumerically in the liste of references and a letter is appended to the year, for example: 2013a, 2013b, etc. The letter will also appear in all in-text citations, for example Miller 2013a, Miller 2013b, etc. You will have to modify your chose citation style to access these settings. Set how the style should resolve ambiguous references in the citation style properties. Ambiguous references can occur if you cite more than one reference by the same author published in the same year. Uncheck the box Append a unique letter (screenshot), and save your citation style. I've checked what you indicated to me, and I already had this set as you said. Actually, I haven't touched Citavi default style, as it works fine for me. And I don't want to change it either because I'd like to have other sources listed by the "a,b,c" system in case of ambiguity. The problem here is that the source I use bears no ambiguity because there is just one source using that surname, so there's no place for the "a,b,c" system to be used (or any other ambiguity-resolving style, for a matter of fact). I always choose the same source from the Citavi add-on Pannel but I get two differentiated identical references in my work, cited using the "a,b,c" suffix (I've just realised it always uses "a", except in the bibliography, where the same source appears cited two times. I don't want to have the differentiation system changed, I just don't want this sole reference to be treated as if it was two differences at the same time. PD: If I misunderstood your response and you actually gave me the answer I was searching for, I'm deeply sorry I lost it. I haven't had to apply your solution because it has seemingly solved itself today without my intervention, but I think that what you suggested would be the solution if it still happened. I'll try it if it happens again. Again, so grateful for your help.